Dec. 13, 2017 was a cold night on the west side of Chicago, but just over 30 community members from across the city made the trip to gather at Malcom X College for the first Getting to Zero Illinois town hall. Getting to Zero is a state-wide initiative that will end the HIV epidemic in Illinois by implementing a statewide plan that is informed by communities most affected by HIV. This first town hall was a crucial step in the process; participants met to learn more about the framework and to express their concerns, hopes and thoughts on what actions are needed in order to achieve the Getting to Zero goal. The meeting space was filled with a mix of emotions and expectations for the night, but, most of all, everyone was there to share their ideas and kick start the Getting to Zero process. One of the most exuberant participants of the night was Rowena Thomas. 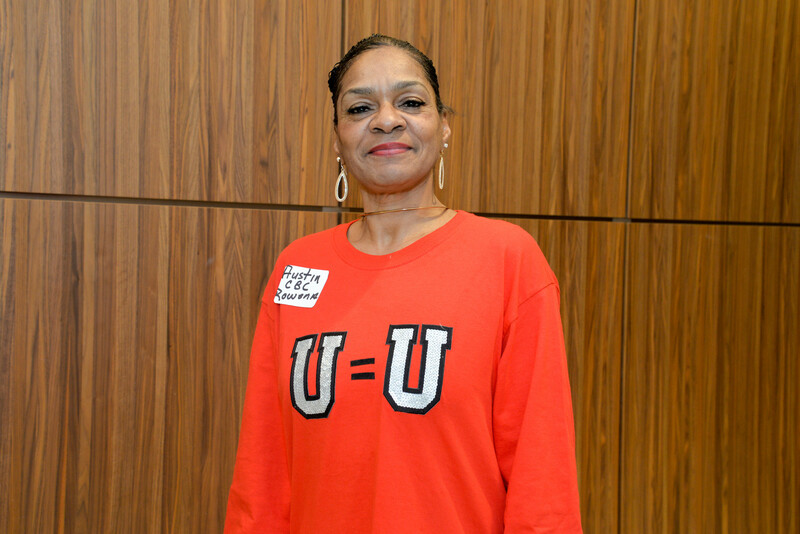 Representing West Side health organization Austin CBC, she attended the town hall wearing a bright red shirt with the message “U=U” emblazoned on the front in bold, silver sequins. Thomas made it clear that her goal was to express the importance of having peer workers at hospitals and clinics across the state to share the insights they have gained through their experiences as people living with HIV. In her role as an HIV tester, Thomas has seen the positive impact of peer workers who help folks navigate their care options and support them in times of need. She believes investing in peer workers is essential to ending the HIV epidemic, and she was met with an applause of support after making the case to other town hall attendees. Overall, Thomas was energized by the meeting and thrilled to be part of the process that will benefit the communities she works with every day. Aside from the importance of investing in peer workers, other common themes that came up throughout the night included: the need to first address various social determinants of health in communities heavily impacted by HIV, different solutions to tackle the stigma still attached to HIV and ensuring that medical providers are aware of and recommending new HIV prevention methods to patients, such as PrEP. Community input is at the center of the Getting to Zero Illinois framework and the first step toward developing a solid plan. This was only the first of many town halls taking place across Illinois; head to gettingtozeroIL.org to RSVP for upcoming town halls in January 2018 and find out how you can get involved with Getting to Zero.